← Why not “constructive transparency”? Both employ metrics that merely enable measurement against past, peer, projected (financial) or predicted (risk) performance. YET, despite the flawed theories, assumptions and practices that were exposed when the banking model failed – it is the template that has spread via financial, digital and supply chain networks [conduits for contagion/systemic risk] – they persist with techniques, tools and practices that lack the “Requisite Variety” [Ashby’s Law] to perform the functions for which they were intended. We can’t identify, let alone address, today’s problems with yesterday’s tools! If we are getting the “right” answers to the WRONG QUESTIONS we are creating false positives. We need to ask the RIGHT QUESTIONS and these need to relate to resilience. The economic downturn beginning in 2008 triggered new interest in risk management, driving adoption of truly holistic approaches where managing risk is inherent to every decision. Today, leading organizations are pushing these concepts further to develop enterprise-wide business resilience strategies. They strive to make the ability to respond rapidly to all kinds of unexpected events—opportunities as well as threats— part of the corporate culture. This means building a business resilience strategy that engages everyone in the organization. True Innovation is driven by feedback from customers: “creative destruction” (Marx/Schumpeter/Hollings) that maintains variety [product, service, operation], required for adaptability and agility. Key components for resilience and sustainability for medium and long term. But, what has been deemed to be innovation within FS, is (what I have come to refer to as) destructive creation: that delivers short term, but unsustainable, results for the model NOT the customer [short-termism is a feature of the culture of Irresponsible Capitalism]. This may satisfy the requirements of 2 & 3 (above) but loss of ‘variety’ leads to self-similarity, which, in time, impairs the ability of the model to remain agile. As the model becomes more closely-coupled and excessively complex the ability to identify, interpret, respond and adapt to signals from its marketplace, inevitably, leads to a loss of trust. The model is fragile. In a changed marketplace, where the customer is in charge (sales/push marketing has been replaced by service/pull) such an organisation CANNOT afford to offer the TRANSPARENCY that its customers, increasingly, demand. Nor can it afford NOT to capitalise upon the opportunities that Social Business offers. Without the appropriate tools and budget it CANNOT de-couple the complexity it has created. Until such time as Regulators, Business Consultants, Risk Managers and the firms themselves recognise that ‘the problem is the solution’ – it is endogenous – they can only react and spend increasing amounts to treat symptoms as/when they appear. The model contains a man-made virus which they have spread through their business networks into every sector and across scales. As a result they now serve as super-spreaders of systemic risk*. Reliant upon known-to-be-flawed economic theory, a failed model, corrupted processes (and culture), outdated methodologies, reputationally damaged, untrusted and unable to respond to customer demands is not only fragile but, increasingly, vulnerable to attack from new models &/or entrants. The solutions DO, already, exist…but NOT where insurers are looking! I don’t expect that too many people will be immediately persuaded that I am correct but some discussion on fundamental issues that will affect the future of the industry is just what I am looking for. Surely it is better to exchange thoughts on a variety of perspectives than to fail to consider what may have such telling and lasting impact. We KNOW that inter-connectedness has transformed the capabilities, reach and pace of the organisations from which insurers’ accept risk transfer. Risk too has evolved. Predictive risk models CANNOT reflect non-linearity so are, at best, dangerously misleading. Of course, IF current risk rating has a credible foundation, we can expect a staunch defence…and change? 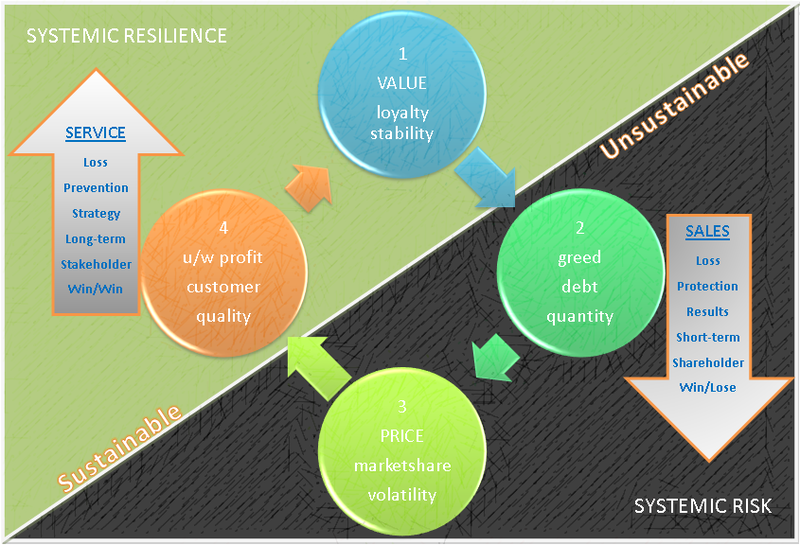 Why rate RISK on [subjective; probability-based; reflexive] predictions of the unpredictable, when it is the business systems’ RESILIENCE: ability to absorb the impact of possible and probable future events, that can be [objectively] measured, monitored, ‘scenario-tested’, rated and managed (if necessary in real-time), that will determine the extent of any resultant loss? Finally, I would like to bring to the attention of anyone who is still reading this article, this piece, from Mark Buchanan (an excellent writer on scientific & complexity matters) in relation to SYSTEMIC RISK. I think it would be fair to say that the scientific view on risk – particularly ‘Systemic Risk’ – and uncertainty is somewhat different (and more rigorous) than that of the experts – acolytes of conventional wisdom – in banking, insurance, risk management and Regulation. ALL of which are prone to ‘political manipulation’! …more risk sharing between institutions can, in some cases, lead to greater systemic risk. [Note: this work was carried out as part of an ambitious European research project called Forecasting Financial Crises, which brings together economists, physicists, computer scientists and others in an effort to forge new insights into economic systems by exploiting ideas from other areas of science].